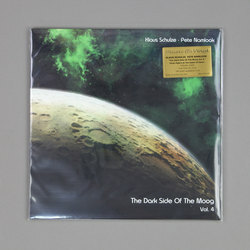 Klaus Schulze / Pete Namlook - The Dark Side Of The Moog Vol 4: Three Pipers At The Gates Of Dawn. Vinyl LP. Bleep. The fourth entry in Klaus Schulze and Pete Namlook’s series of Pink Floyd reinterpretations was originally released in 1996. The Dark Side Of The Moog: Three Pipers At The Gates Of Dawn focusses - surprise surprise - on Pink Floyd’s debut studio LP Pipers At The Gates Of Dawn. However, the ‘three’ in the title arises from the addition of acclaimed bassist Bill Laswell. This is one of the sprightlier of the eleven TDSotM records, with several of the movements throwing caution to the wind and breaking out into full-on techno. However, those who come to these albums for synth wizardry and unsettling ambiences won’t be disappointed by numbers such as ‘Part 3’ and ‘Part 7’.